Here it comes! Another holiday at Live in Fitness, and we know everyone loves to use as an excuse to binge! Everyone has that urge so don’t feel so bad. Besides, we got your back! Eggs are an old staple of Easter and what better way to start your Easter Sunday than with a delicious breakfast of eggs, greens, and fruit! Chef Andie will walk you through all the steps needed to make this delicious meal. She’ll show you exactly what you need to do to make your Easter eggs the perfect and healthy way. Check the ingredients you will be needing below! 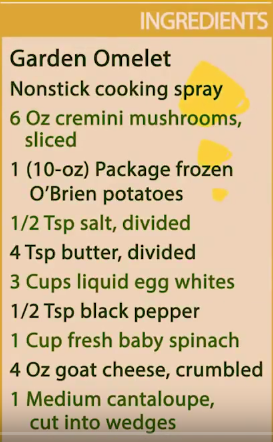 This recipe is part of a giant vault of videos and recipes given to you when you complete our program. It’s just a taste of the kind of nutritional training you receive at our fitness retreats . We provide a multitude of classes with the sole purpose of preparing you for home so you can KEEP THE WEIGHT OFF FOR GOOD! Check out our AMAZING DEAL and join us at one of our beautiful locations in Hilton Head or our newest location in Los Angeles! https://www.liveinfitness.com/wp-content/uploads/2017/04/Screen-Shot-2017-04-12-at-5.36.18-PM.jpg 418 631 themepunch https://www.liveinfitness.com/wp-content/uploads/2018/08/unnamed.png themepunch2017-04-14 14:28:092017-04-14 14:42:52Easter Eggs & Ripped Abs?! Whaaat?! TIME FOR A BEAT DOWN. SMASH FAT INTO SUBMISSION. We are here to provide you with some very successful weight loss tips and tricks that we teach and preach at our fitness camps! If you want to burn fat and develop your stamina you NEED cardio. But running, cycling, and swimming isn’t for everyone. Many people choose to focus on competitive sports as their cardio exercise. That’s where BOXING 101 comes in. The perfect cardio exercise for anyone looking to learn a new skill, lose weight, and increase your stamina. Arthur will walk you through a 20 min workout that will leave you feeling the burn in your entire body, sweating brutally, and with a good jump start on learning to box correctly. You will learn to punch properly, basic combos, and proper footwork all while forcing you to do the required cardio exercises you need for your daily workout. Are you ready for this? Ding! Ding! ROUND ONE! CLICK BELOW! This exercise is part of a giant vault of videos given to you when you complete our program. It’s just a taste of the kinds of fun and effective workouts we do at our fitness retreats. We provide a multitude of classes including dance, boxing, hiking, spin, yoga, and much much more! Check out our AMAZING DEAL and join us at one of our beautiful locations in Hilton Head or our newest location in Los Angeles! https://www.liveinfitness.com/wp-content/uploads/2017/04/Screen-Shot-2017-04-05-at-12.01.29-PM.jpg 416 695 themepunch https://www.liveinfitness.com/wp-content/uploads/2018/08/unnamed.png themepunch2017-04-07 14:10:552017-04-07 14:10:55TIME FOR A BEAT DOWN. SMASH FAT INTO SUBMISSION.